I don’t know why it doesn’t occur to me to always have precooked rice, lots of fruits and/veggies, and chicken on hand to make a hodge podge rice bowl. These kinds of meals are always exactly what tastes so good to me and what leaves me feeling satisfied. I do have a ridiculous love for rice so I try not to eat too much of it (hence why it’s never in the house). If I could figure out how to control myself, maybe I could actual have certain foods on standby. But rice with chicken and fruits or veggies along with an Asian flavored sauce or a light vinaigrette is usually my perfect little meal. 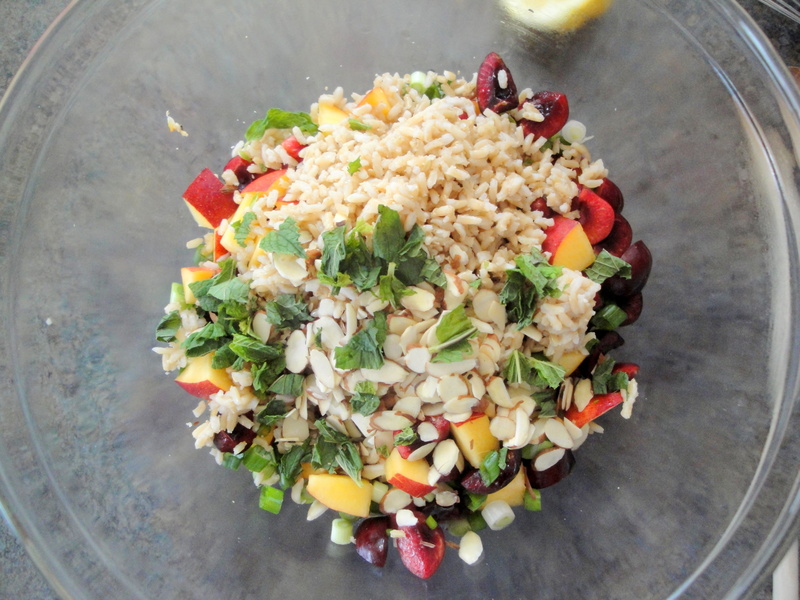 Which explains why I was so drawn to this Stone Fruit Chicken-Rice Salad. 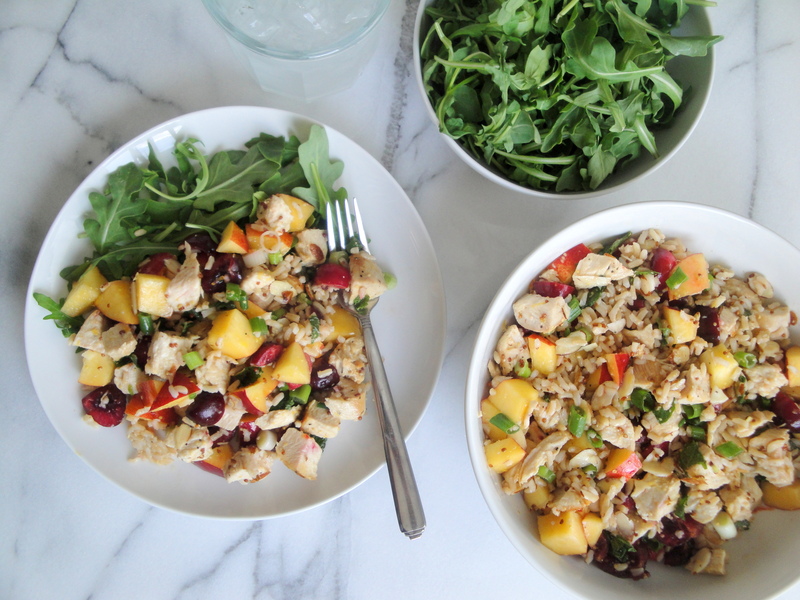 Grilled chicken, nectarines, brown rice, cherries, scallions, almonds, and mint are mixed together before being tossed with a simple vinaigrette of olive oil, lemon and Dijon. 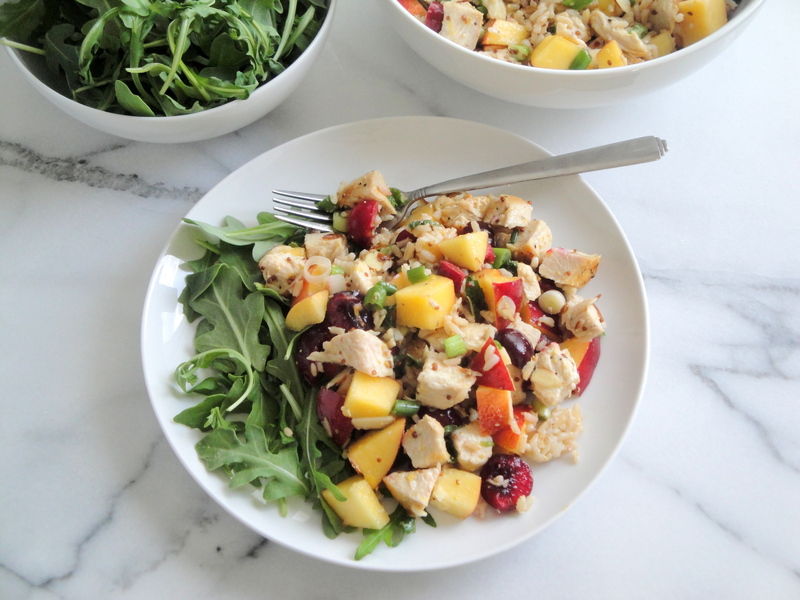 Served with whatever kind of green you like (I used arugula), this salad is a perfect lunch or even a light which takes advantage of summer’s fruits. 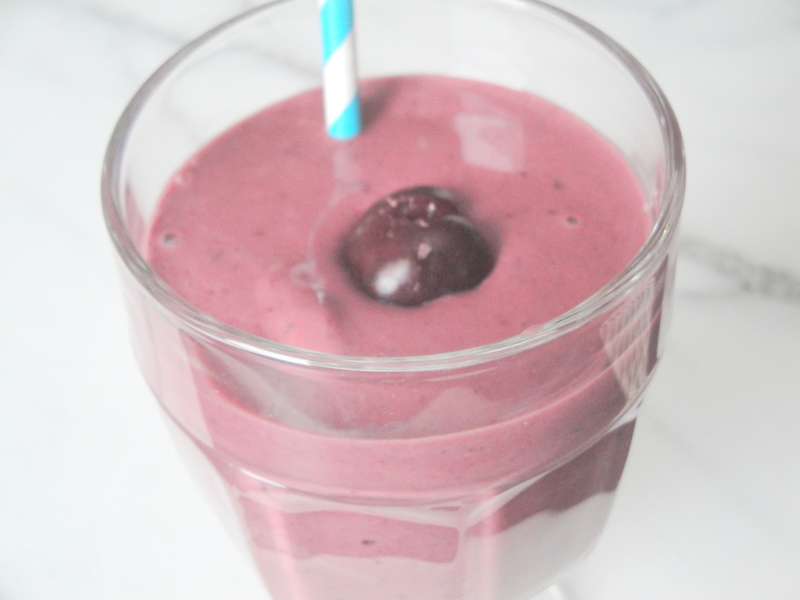 I look forward to nectarines, peaches, berries and especially cherries each year so as soon as I saw cherries in the store, I grabbed a huge bag no matter the cost. Substitute this salad with rotisserie chicken, turkey, blueberries, corn, spinach, zucchini, basil, tomatoes or whatever your heart desires. No matter what you throw in, you won’t go wrong. Preheat grill to medium-high heat. Sprinkle both sides of chicken evenly with 1/2 teaspoon salt and 1/4 teaspoon pepper. 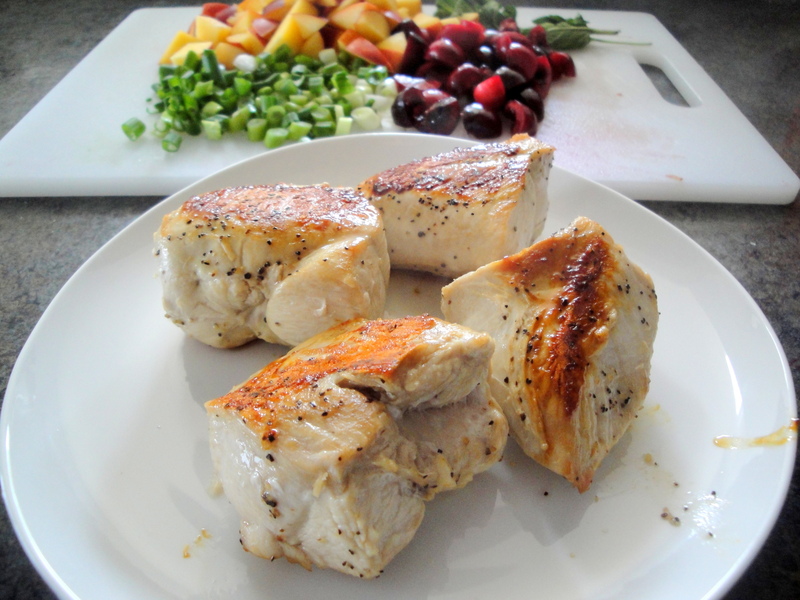 Place chicken on a grill rack coated with cooking spray; grill 5 minutes on each side or until done. Let stand 5 minutes. Chop chicken. 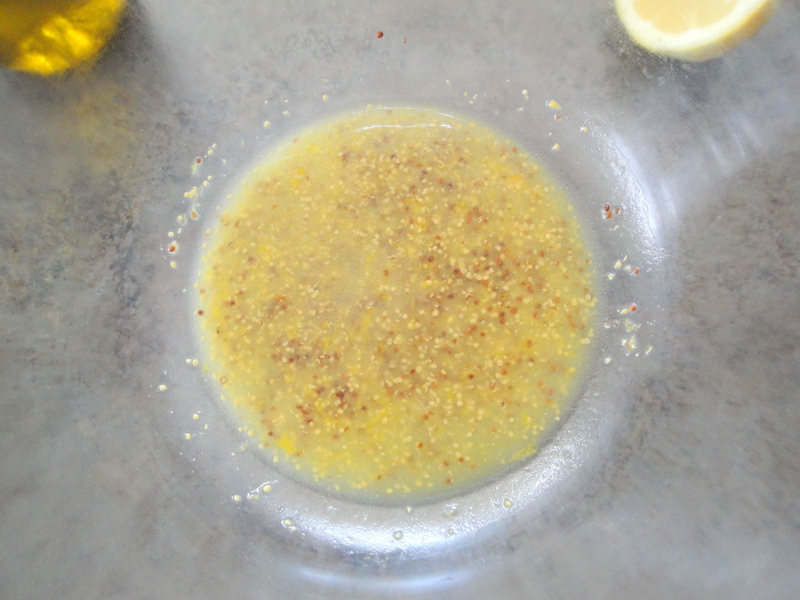 Combine oil, rind, juice, and mustard in a large bowl, stirring well with a whisk. 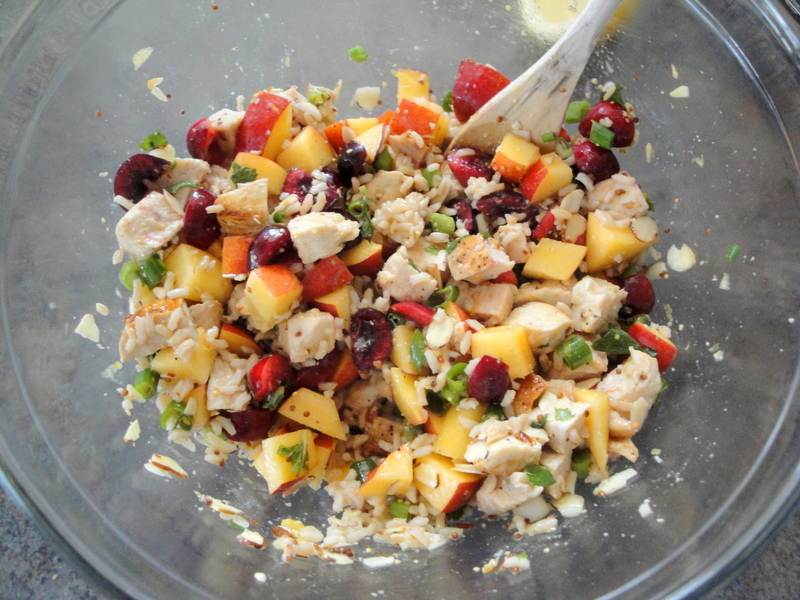 Add chopped, cooked chicken, nectarines, and remaining ingredients; toss well. I try to change up the cookies I make every year because the only cookies I’m willing to repeat are my peanut butter cookies (thanks to my family and friends who always say “But you are making your peanut butter cookies, right?”). If you aren’t careful, you can either end up with a bunch of beige/white cookies (i.e. 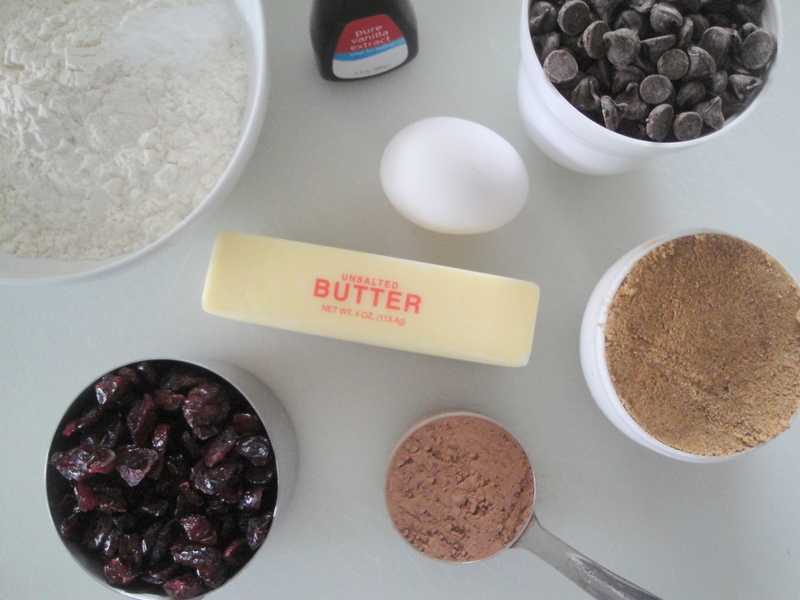 peanut butter, sugar, chocolate chip, butter) or nothing but chocolate cookies. I like to have a little bit of both. These Oregon Chocolate-Cherry Cookies may not sound like holiday cookies but really, who’s to judge? Any cookie is a holiday cookie in my opinion. And what holiday isn’t made better by lots of chocolate? These cookies have both cocoa and chocolate chips and are topped with a drizzle of even more melted chocolate. Dried cherries added another layer of flavor which I have to say is what drew me to these cookies (which is I guess why they are called Oregon cookies). Dried cherries are like candy to me and I will eat them in just about anything. 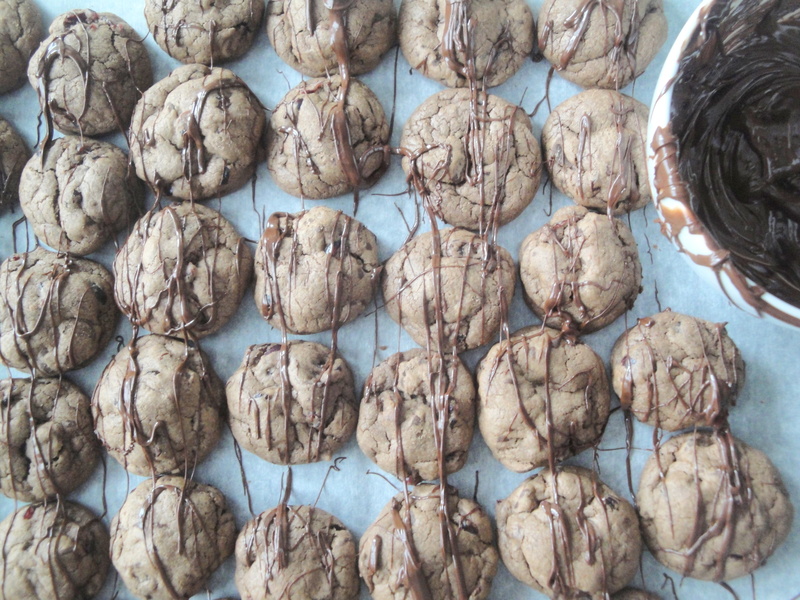 These cookies are chewy and very chocolatey – perfect for the chocolate lover in your family. 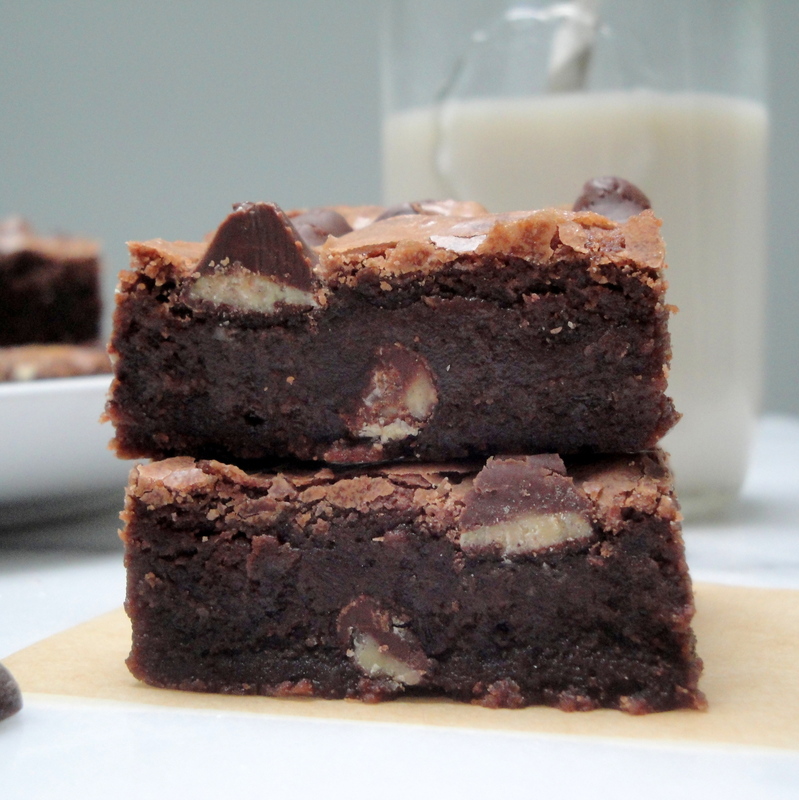 Leave a plate of these for Santa and he’ll be happy. Just don’t forget the milk! 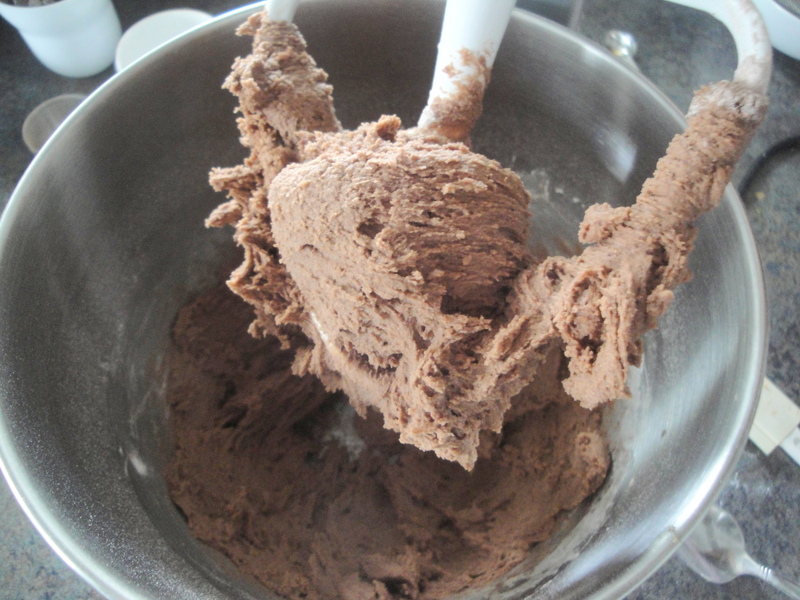 Beat butter and sugar at medium speed with an electric mixer 2 minutes or until light and fluffy. Add egg, beating until smooth, stopping to scrape down sides as needed. Stir together flour and next 3 ingredients. 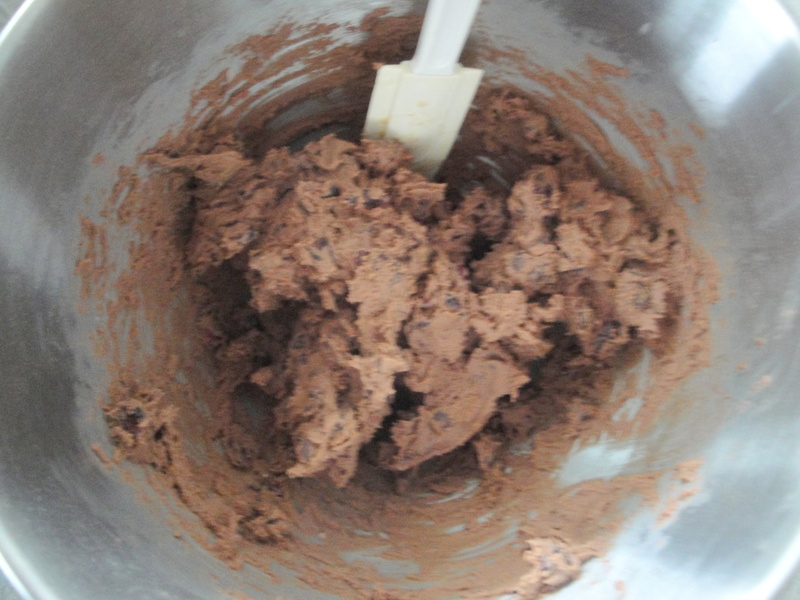 Gradually add to butter mixture, beating at low speed until blended. 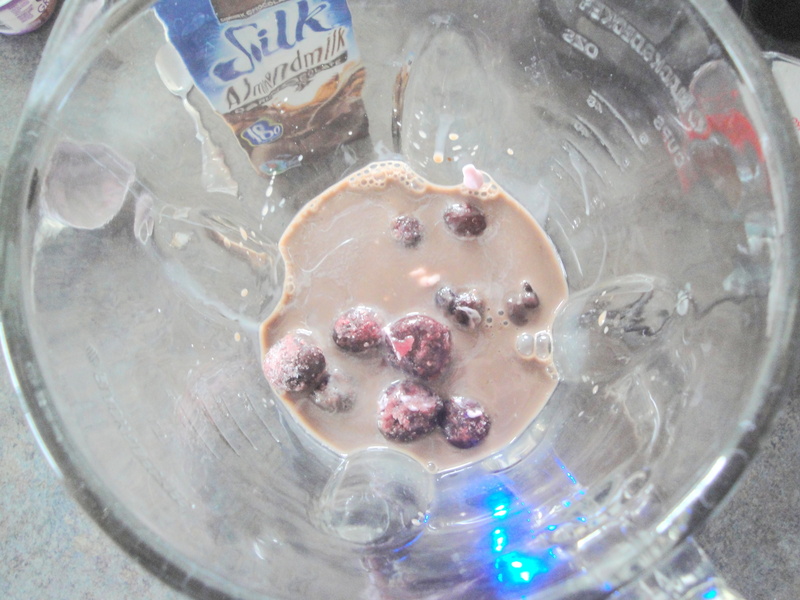 Stir in 1 cup semisweet chocolate morsels and dried sweetened cherries. 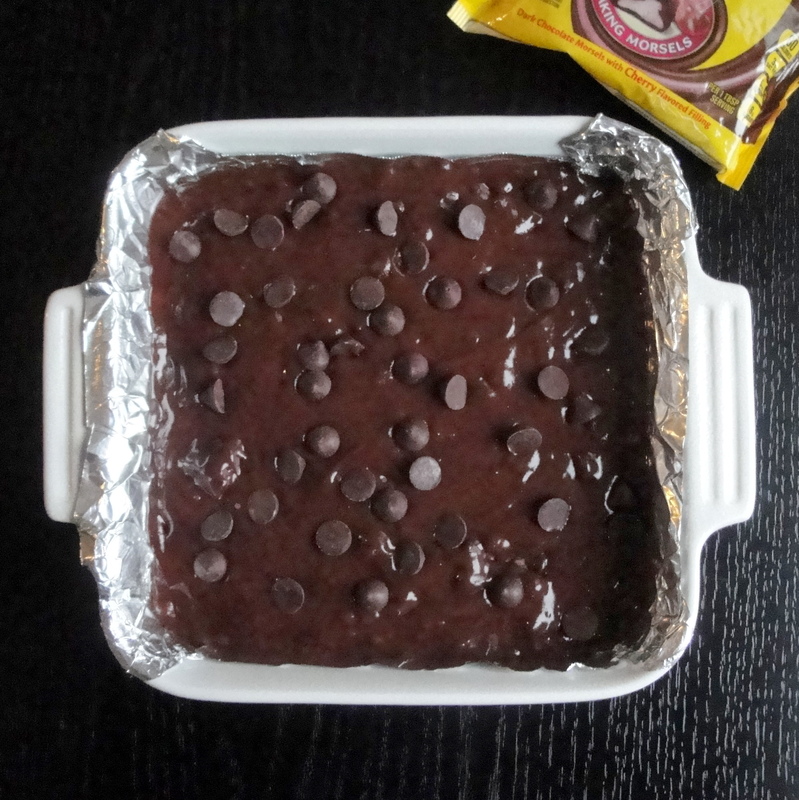 Drop by rounded tablespoonfuls 2 inches apart on lightly greased or parchment paper-lined baking sheets. Bake, in batches, at 350° for 10 to 12 minutes. Let cool completely on wire racks. 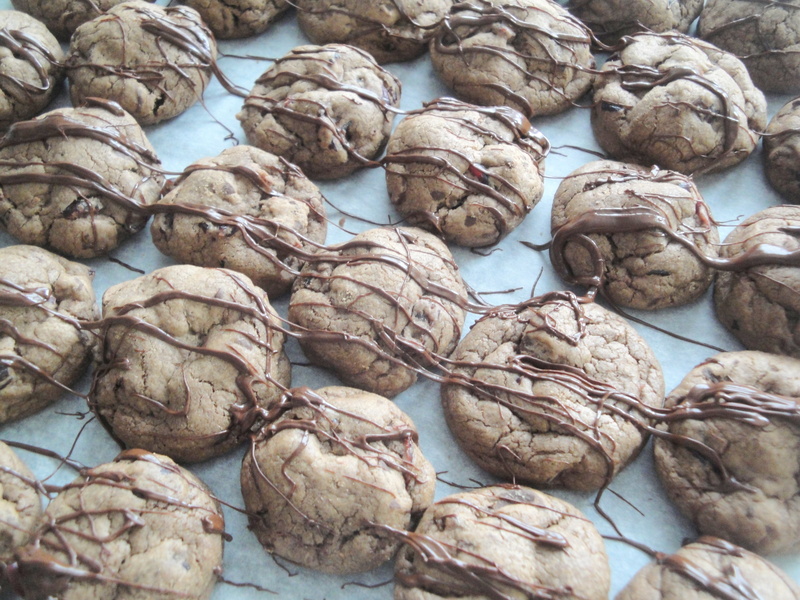 Drizzle cookies with 1/2 cup semisweet chocolate morsels, melted, if desired. I’m back! Well, I’ve been back for over a week and had sooooo much fun in Vegas that I needed many days to recover. Well, not really, but I did need some time to recover but the other days away from my blog were needed to get my life back in order with routine, work, and eating. Before Vegas I hadn’t gone grocery shopping since I was going away and when I got back, I jumped right into work and sleep and never made it to the store so my eating habits consisted of coffee and any Asian chicken salad I could get my hands on. When it comes to sweets, I tend to reach for a small handful of chocolate chips because I’m one of those people who have chocolate chips on hand ALL. THE. TIME. Usually, I have some dried fruit as well, as I like to mix the fruit and chocolate with peanuts. Talk about a yummy little snack. 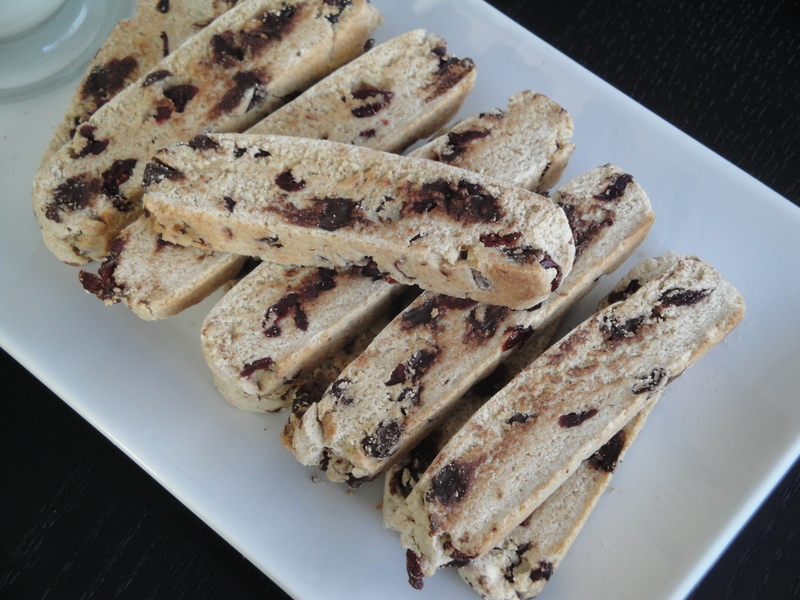 Anyway, this Chocolate-Cherry Biscotti caught my eye because it’s two-thirds of my favorite snack rolled up into one little crunchy dunkable cookie. 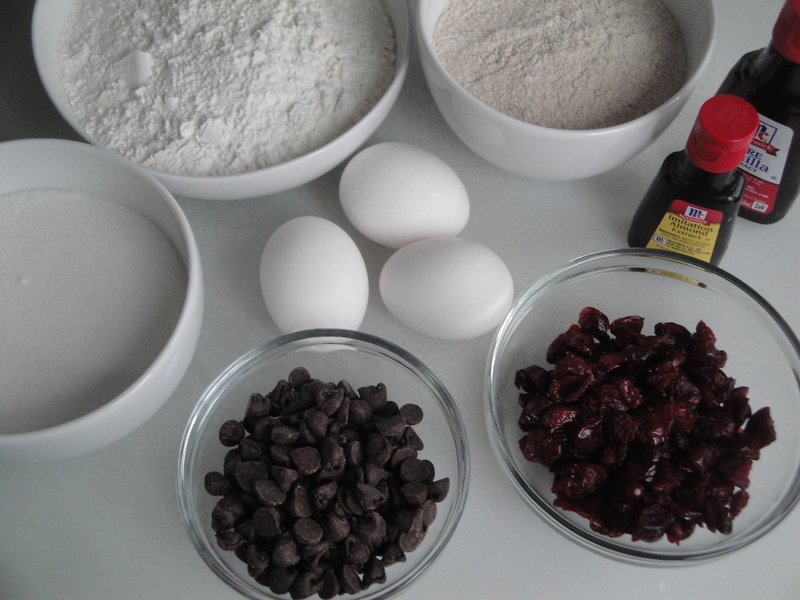 Chocolate chips and dried cherries are mixed into a thick cookie dough batter, flattened, baked, cut and baked again to result in these crunchy on the outside but slightly soft on the inside cookies. 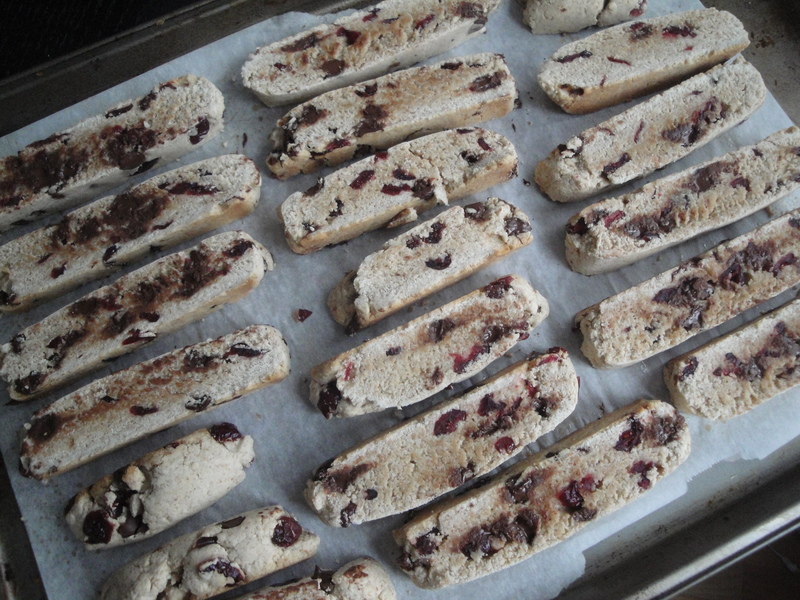 I’d never made biscotti before as I’m generally not the biggest biscotti fan (too crunchy) but I loooooooved these! 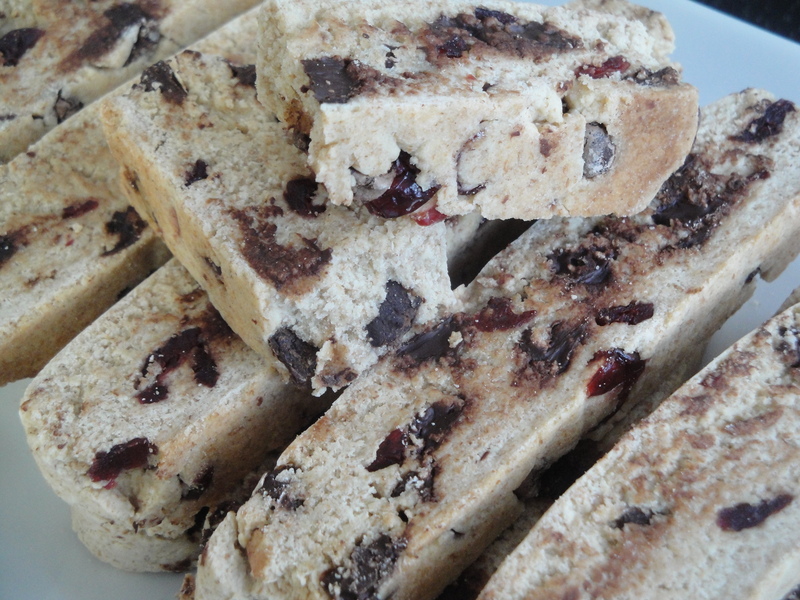 Maybe biscotti isn’t supposed to be a little bit soft on the inside but mine turned out that way and I was hooked. 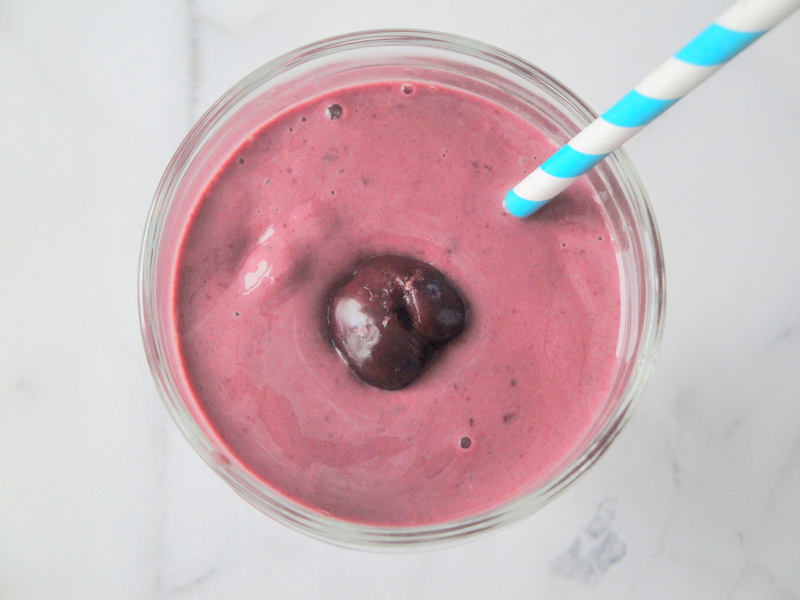 The sweet chocolate and tart cherries are a marriage made in cookie heaven. On a side note, I made these on a Saturday while Extremely Loud and Incredibly Close played on the TV in the background and I ended up watching the whole movie without meaning to. Now when I think about these biscotti, I can’t NOT think about that movie. 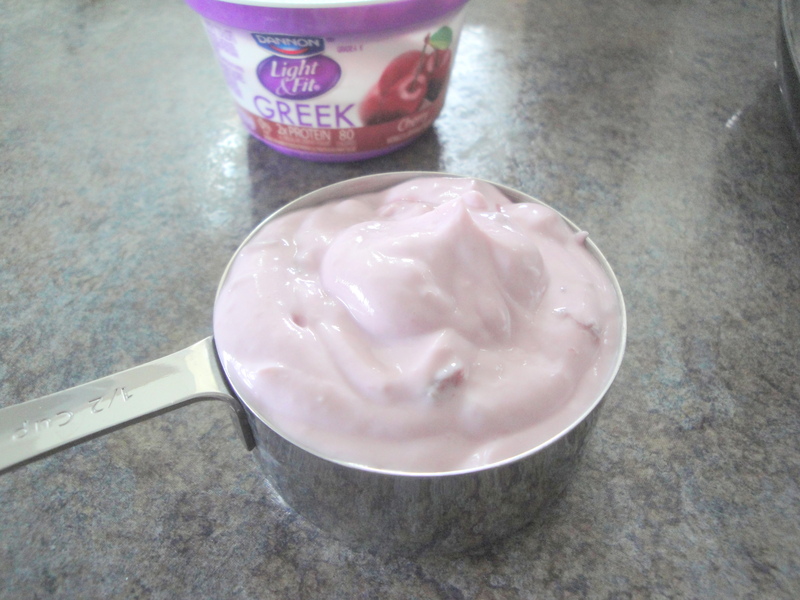 Strange how certain foods will forever remind you of something completely unrelated to food. 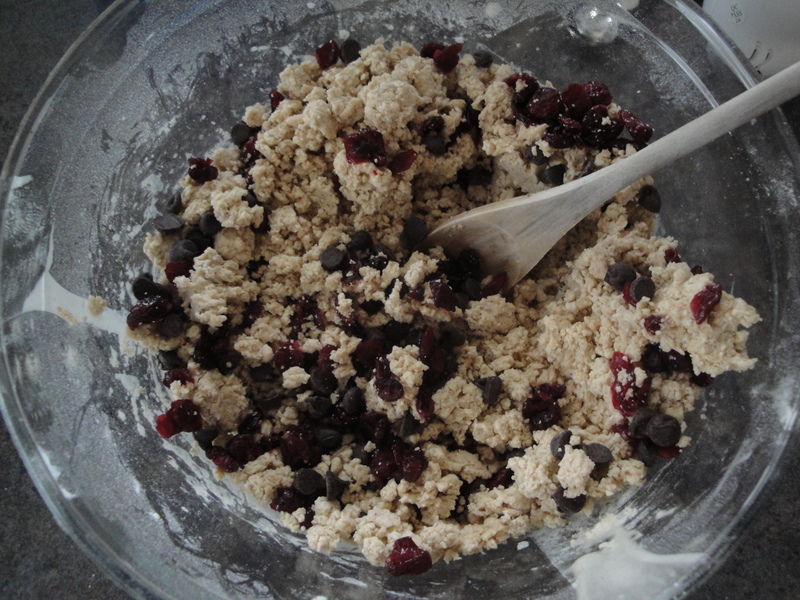 Lightly spoon flours into dry measuring cups, and level with a knife. Combine flours and salt in a bowl; stir well with a whisk. 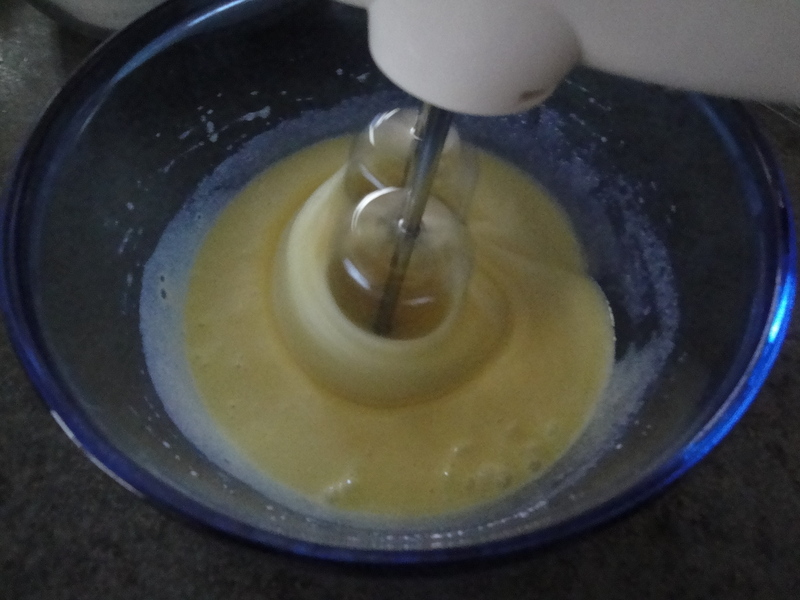 Beat sugar and eggs with a mixer at high speed until thick and pale (about 4 minutes). Add oil and extracts, beating until well-blended. 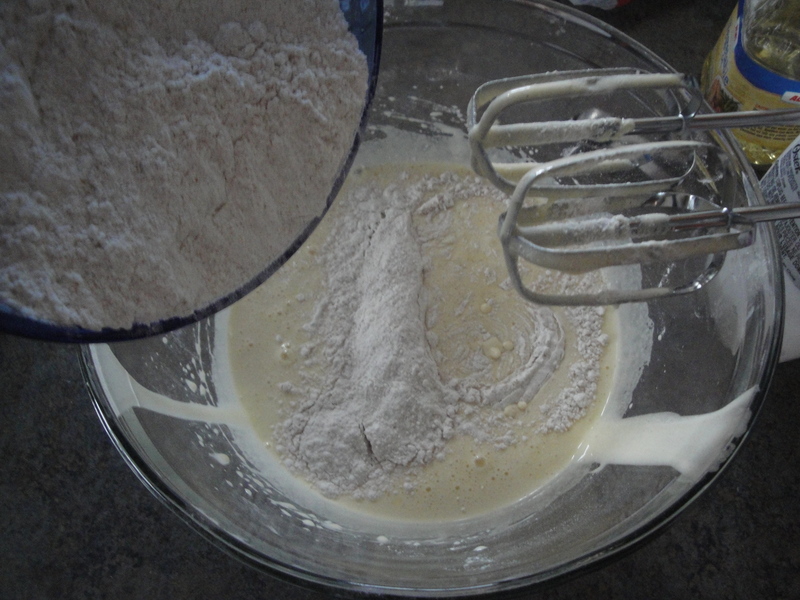 Add flour mixture, beating at low speed just until blended. 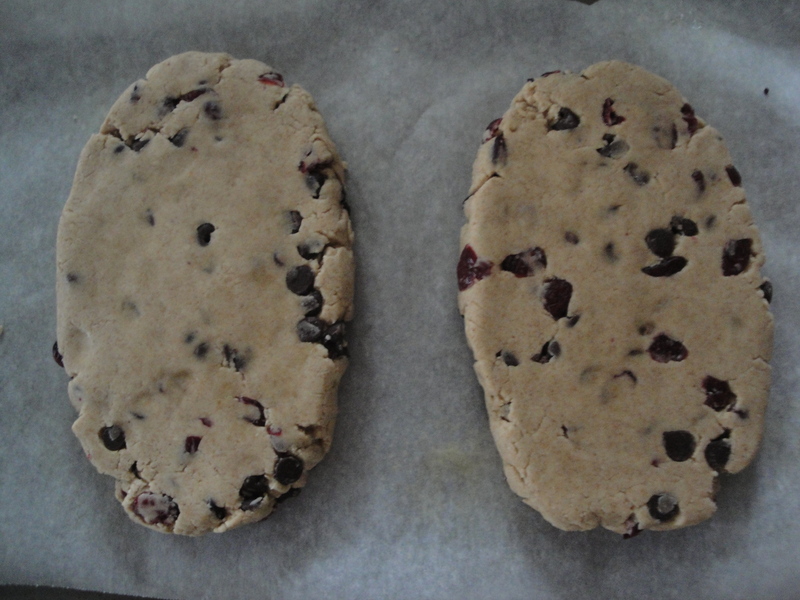 Divide dough in half; turn out onto a baking sheet coated with cooking spray. Shape each portion into a 10-inch-long roll, and flatten to 1-inch thickness. Bake at 350°F for 25 minutes or until lightly browned. Remove rolls from the baking sheet; cool 10 minutes on a wire rack. Reduce oven temperature to 325°F. Cut each roll diagonally into 20 (1/2-inch) slices. Place slices, cut sides down, on baking sheet. Bake at 325°F for 10 minutes. Turn cookies over, and bake an additional 10 minutes (cookies will be slightly soft in center but will harden as they cool). Remove from baking sheet; cool completely on wire rack. For example, I went to Target with no other reason than to look at food processors. I left Target with a cast-iron skillet, white pepper, 100% pure maple syrup, and soy sauce. Really? I didn’t even remember to look at the food processors. This is what happens to me when I have nothing to do. I lose my mind. 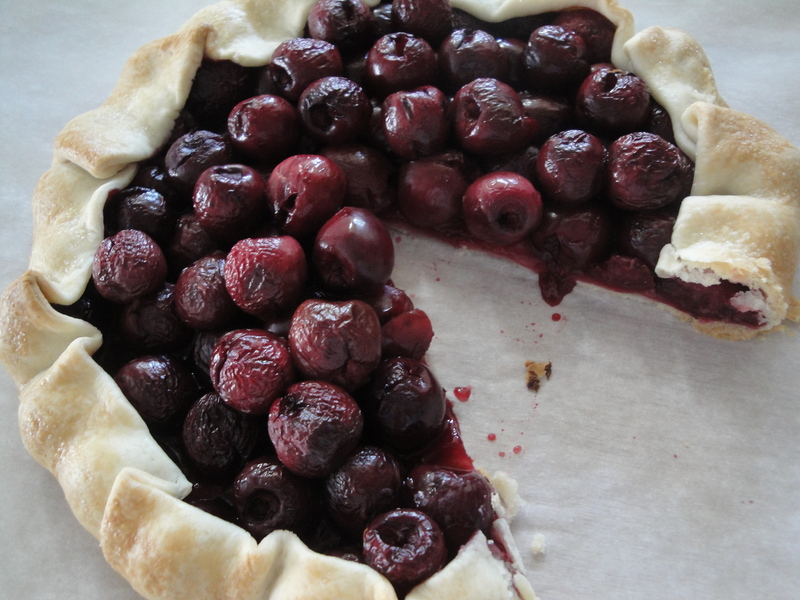 Shaking my head at my absentmindedness, I proceeded to have a glass of wine with a piece of this Fresh Cherry Galette for dinner. This is what my Saturdays have come do. Shopping for kitchen products and eating dessert for dinner. My how times have changed. 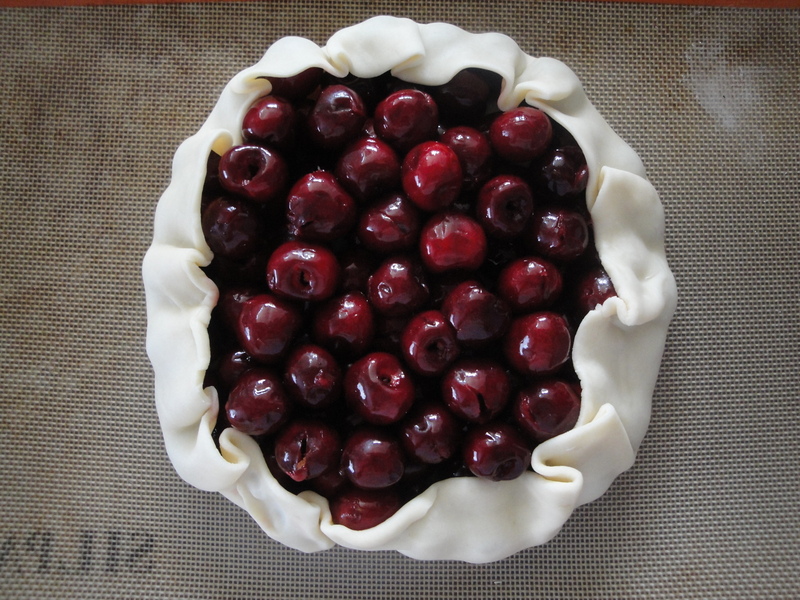 Fresh cherries are tossed with sugar, lemon juice and lemon zest, folded into a pie crust and baked until golden brown. 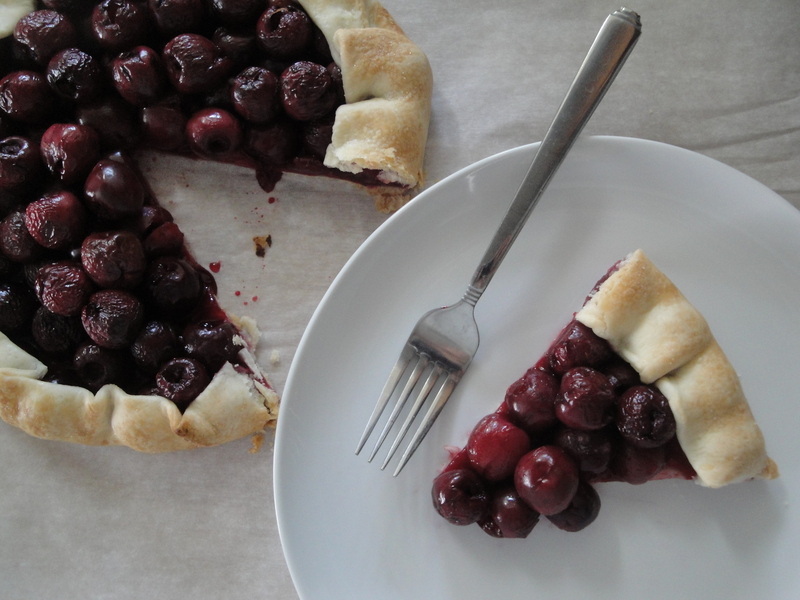 The cherries become soft and sweet, but not too sweet making this a lovely, light summertime dessert, or meal, whatever. I ended up spending my evening watching sci-fi movies in the dark and decided sometimes you just need a day with nowhere to be, no obligations, to do whatever you want. I love days like that. 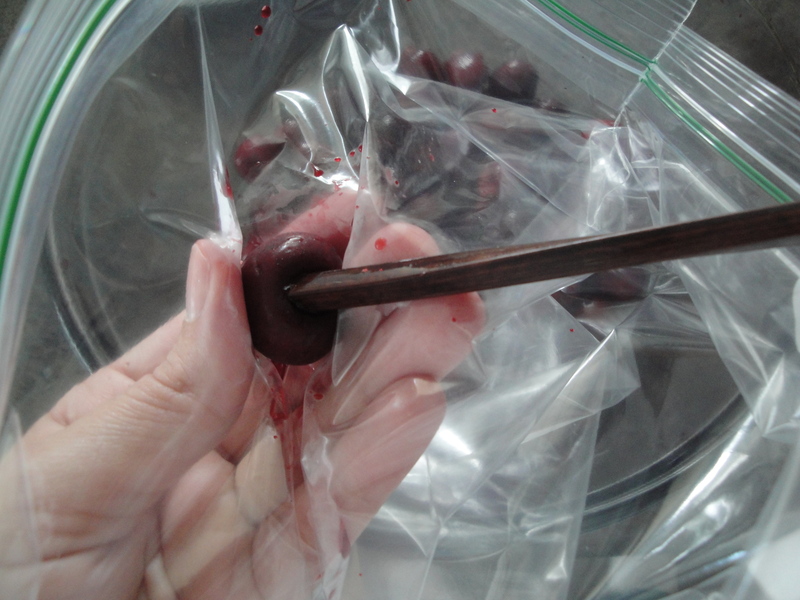 To pit the cherries, use a sturdy straw or the end of a chopstick to poke into the top of the cherry. 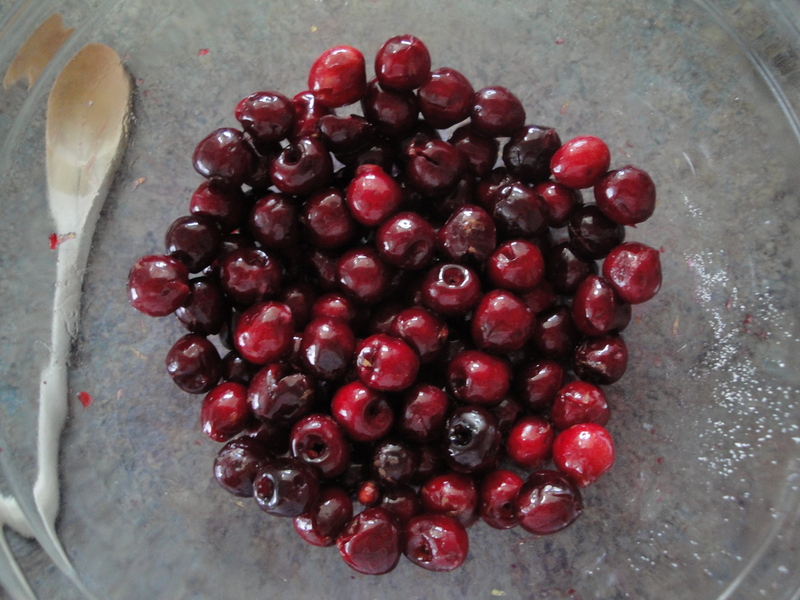 Twist and push gently until the seed pops out the bottom of the cherry. Use gloves to prevent staining your fingers or use a storage bag which will work double duty to catch the seeds. 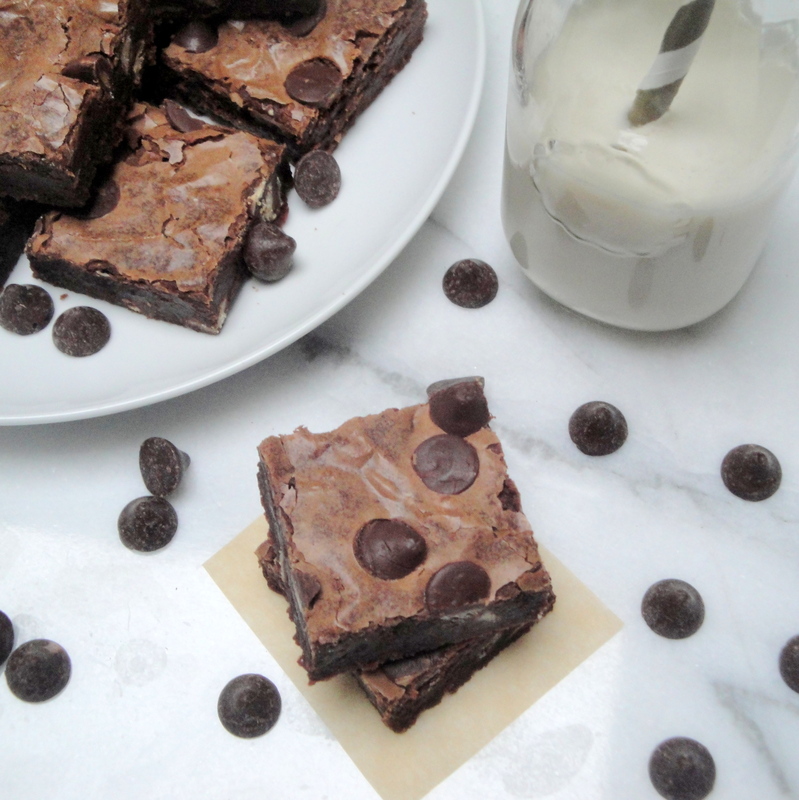 Line a baking sheet with parchment paper or a silicone mat. Unroll pie dough. 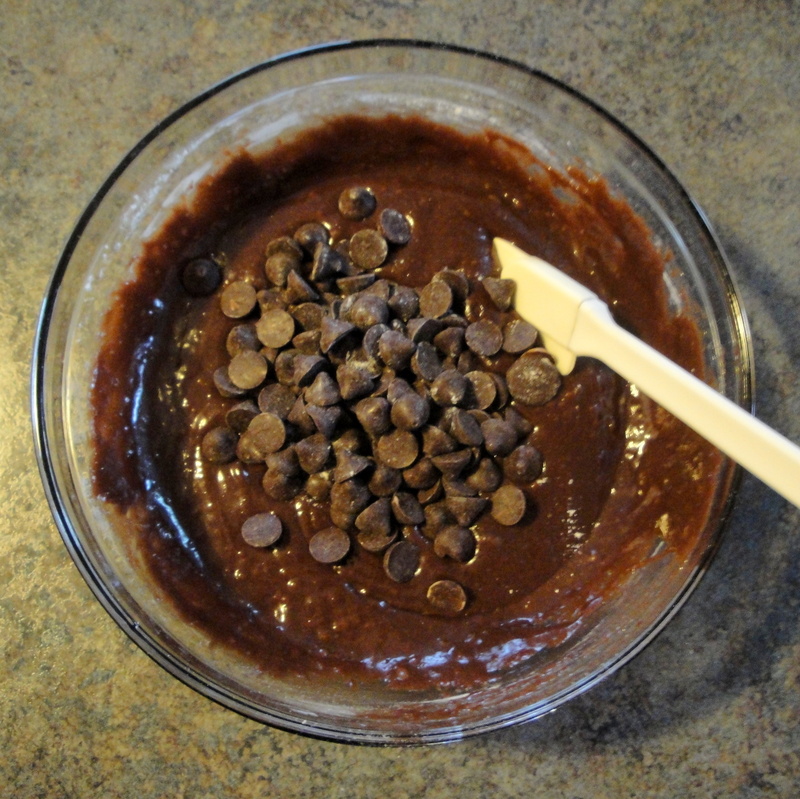 Combine 1 tablespoon sugar and 1 1/2 teaspoons cornstarch, stirring with a whisk. 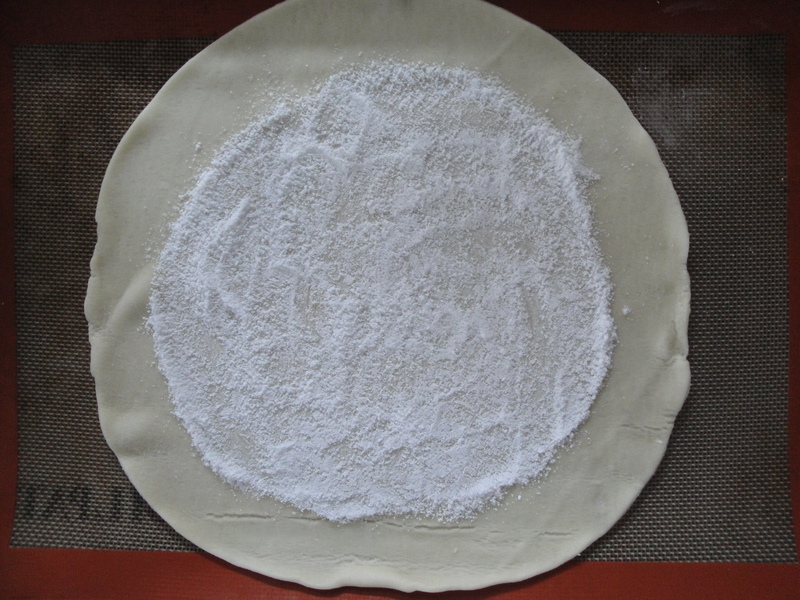 Sprinkle cornstarch mixture over dough, leaving a 2-inch border. 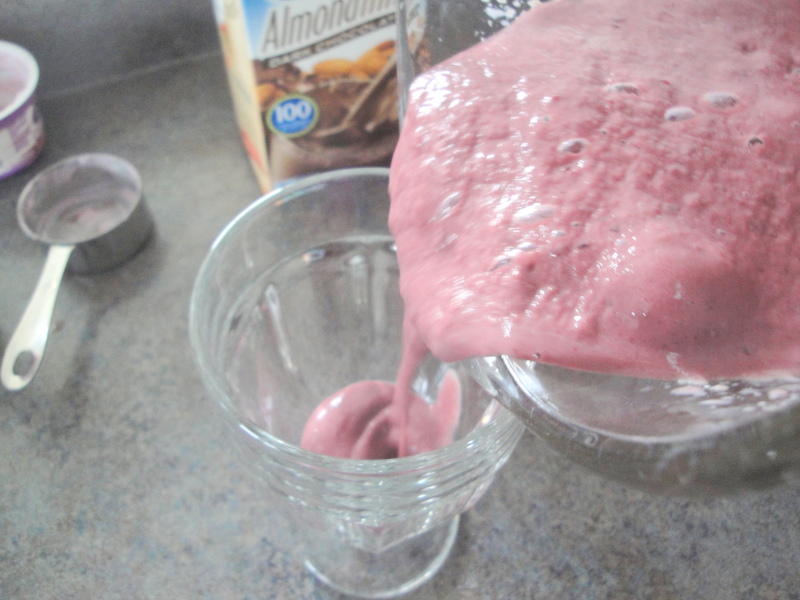 Combine the cherries, remaining 2 tablespoons granulated sugar, rind, and juice; toss well to coat. 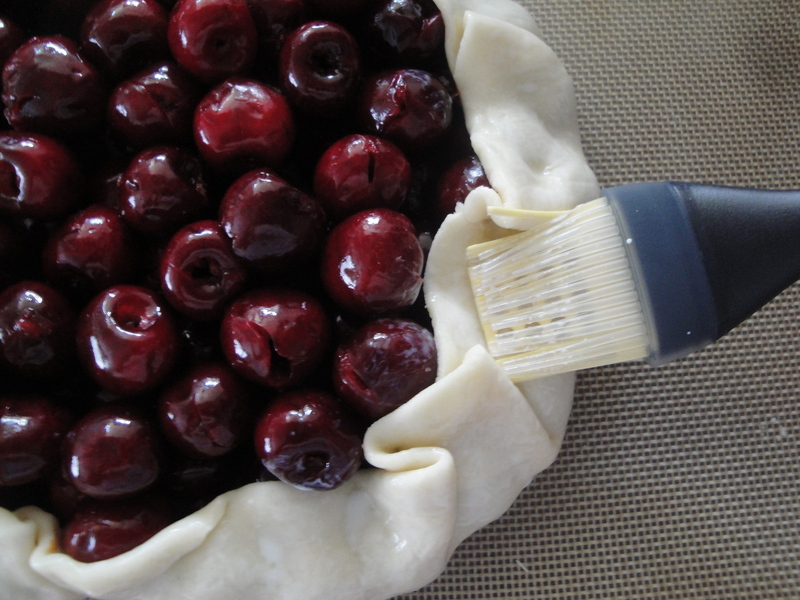 Arrange cherry mixture over dough, leaving a 2-inch border. 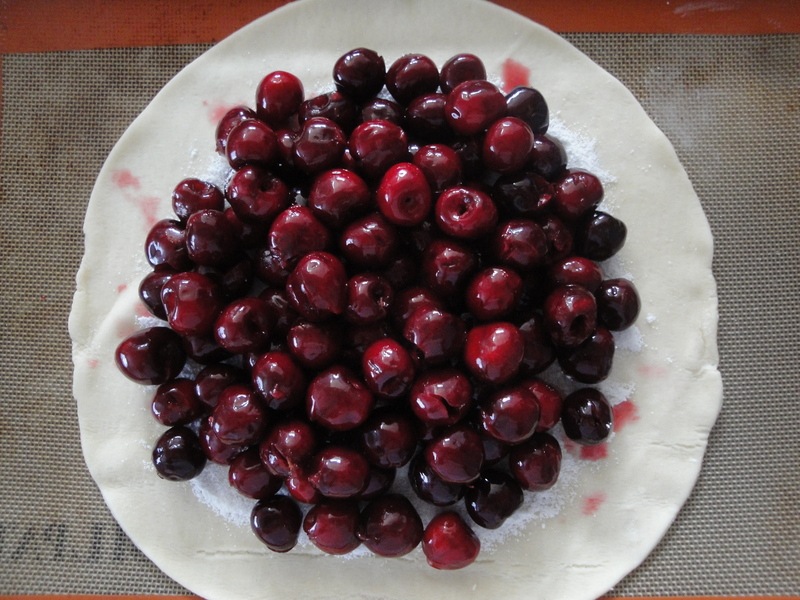 Fold dough border over cherries, pressing gently to seal (dough will only partially cover cherries). 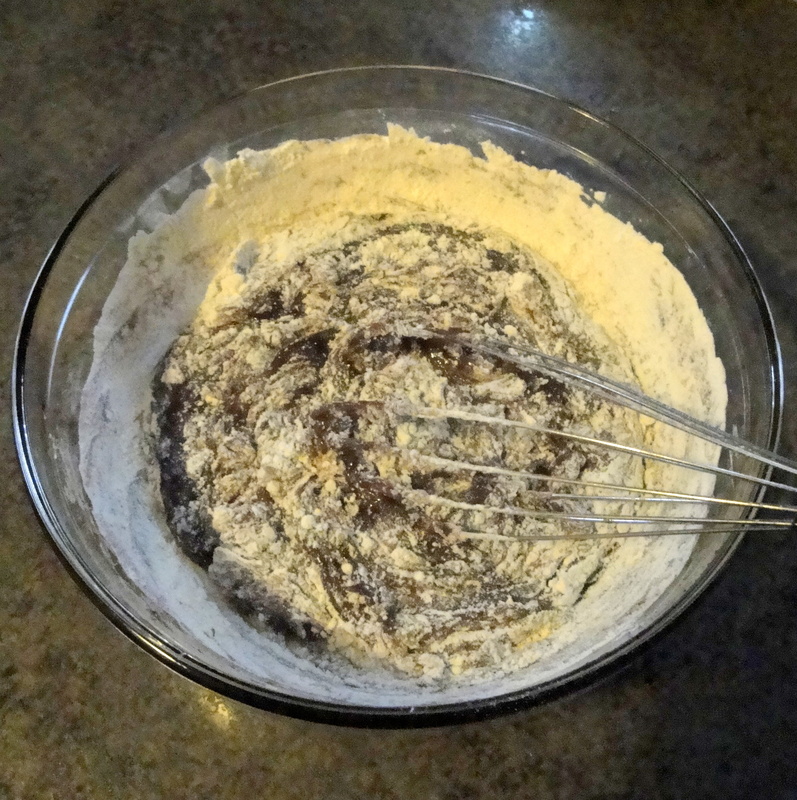 Brush edges of dough with milk. 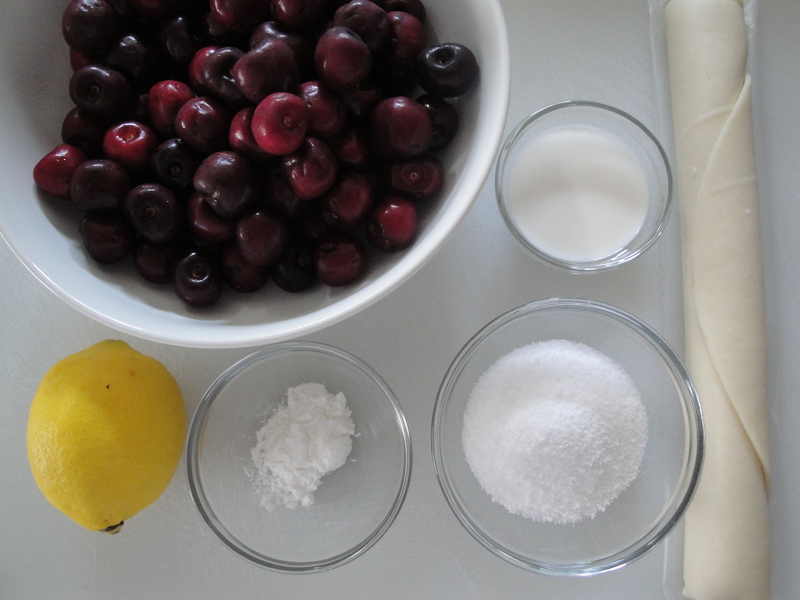 Sprinkle sugar over cherries and edges of dough. Bake in a 400°F oven for 25 minutes or until dough is browned and juices are bubbly. Remove from oven; cool on pan at least 20 minutes before serving.